Question was posed, is there land tax for property in Victoria held in an SMSF. The answer is yes, however the general land tax rates rather than the surcharge rates apply as an SMSF is considered to be an excluded trust. Furthermore, I understand from a lawyer that this is dependent on filling out the notice of acquisition of an interest in land correctly so obtain legal advice about this. The general rate means land with a ‘council site valuation’ over $250k will incur land tax. See rates and SRO guidance on excluded trusts below. 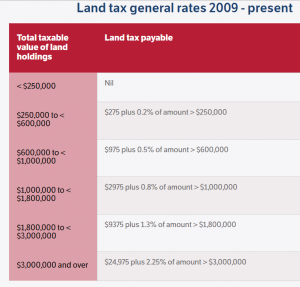 Note that land tax is a state based tax so laws and rates in other states will vary.